What to look for when buying hand tools; the heaviest, most expensive tools might not always be the best choice. They might last forever but may not always be comfortable to use, and you may end up not using them at all. However, cheaply made tools often fail because corners are cut in the materials used or the way in which the materials are put together. Don’t buy them just because they are the cheapest tool on the shelf; look for quality, durability and comfort of use. Inspect the point at which the metal head meets a wooden handle. The head should not just be pounded into a hole bored in the handle or it will soon come apart. Look for a rivet or two that hold the metal head into holes drilled through the wooden handle. Sharp-pointed spade – A garden spade has a flat end and is handy for edging around flower beds and sidewalks, spreading materials, and skimming sod off new garden beds. Spading fork – This really comes in handy for turning over the compost pile and harvesting root crops like carrots and beets. It also can be used to turn over the soil, like a spade. Make sure the tines are square or reinforced, since thin flat tines will bend during use. Hand Pruners – Hand pruners are made for smaller pruning tasks. Use for roses, trees and shrubs that don’t have huge limbs. A quality hand pruner will be made of forged steel and have a resharpenable blade. The handles will be cushioned with rubber and erognimically made for comfort. Loppers – These are bigger, long-handled versions of the hand pruner. The extra leverage the long handles provide, combined with the heavier, stronger jaws, allow them to cut branches up to an inch or more thick. Loppers also extend your reach. Pruning saw – If a lopper can’t cut it, saw it off by making a cut first on the underside of the limb. This will prevent tearing and splitting under the weight of the limb when you complete the job by sawing from the top down. Mattock – If you have to tear out old, established plantings, the mattock is your tool. It both chops and pries out old root systems. 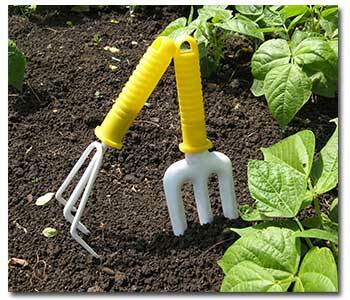 Cultivator – A cluster of metal tines on a long handle, a cultivator is used to break up hard, crusty soil around plants. Trowel – A garden trowel is a multipurpose garden tool with a blade of metal and a handle. The blade of the trowel may be attached to the handle with a curve or lift, as in a shovel, or straight, as in a spade. Long-handled trowels allow the user to avoid stooping and bending. Weeder – Many types of small weeding devices are on the market. One of the handiest is the v-weeder. Is looks like a screwdriver with a wide tip notched with an inverted V. It is used to dig out deep-rooted plants like dandelions, harvest asparagus, and dig weeds out from between paving bricks or stones. Garden rake with heavy iron teeth. Those attached to the handle by a bow that runs from either end of the head are stronger than those attached at the center of the head. This will be used for leveling off the soil after spading, cleaning up debris, marking wide rows for planting and, when flipped over on its back, pulling soil over rows of seeds. Hoe with a six-inch-wide head, for chopping weeds, mounding earth, making furrows and, when one corner is dragged along a line, making shallow trenches for planting vegetable seeds. Lawn or broom rake for raking leaves and other clean-up jobs. Anvil-type hand pruning shears – Make sure the cutting blade is heavy enough for the task. Carry it with you every time you go out to garden; you will always have a use for it. A long-bladed knife. A kitchen reject with 10-inch blade is fine; the thinner the better. Use it to harvest lettuce, cut string, or hack off intruding grass. Slide it under weeds to pop them out. Spreaders – There are two basic types: drop spreaders, in which a small paddlewheel at the bottom of a bin controls the amount of material spread, and broadcast spreaders. Purchasing quality tools will save you in the long run. Checking your tools regularly and cleaning them after each use will also keep your tools like new for years to come.